Beautiful fireplace design, mantel and fireplace wall decorating can change the way living rooms, bedrooms, and dining rooms look and feel. 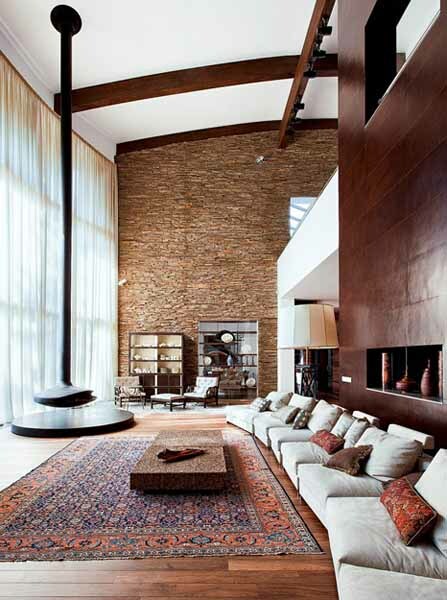 Gorgeous fireplace design and wall decor make a stunning focal point for modern interior decorating. An inspiring color palette and attractive combinations of textures create spectacular accent walls and add unique character to any home decorating. Lushome presents beautiful and modern ideas for decorating around a fireplace. 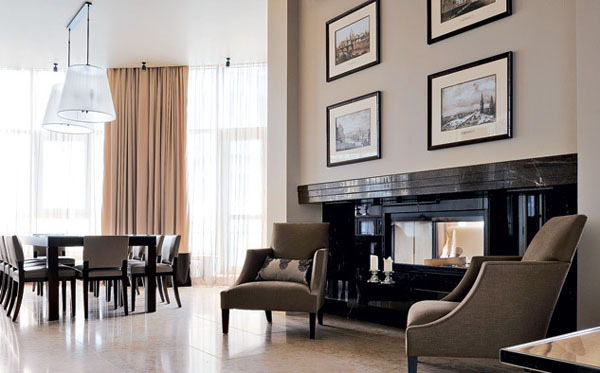 Functional and modern fireplaces are an essential element of warm and cozy interior design. Beautiful fireplace design makes a room look more beautiful, comfortable and pleasant. Fireplace design is an artistic and emotional process of creating large home decorations. Intimate and original fireplace design personalize a room and creates a cozy, inviting, comfortable and modern home interior. Following the old traditions of adding fireplaces to living rooms, dining rooms, and bedrooms, the modern interior design includes fireplaces as the unique architectural features and home decorations into beautiful living spaces. 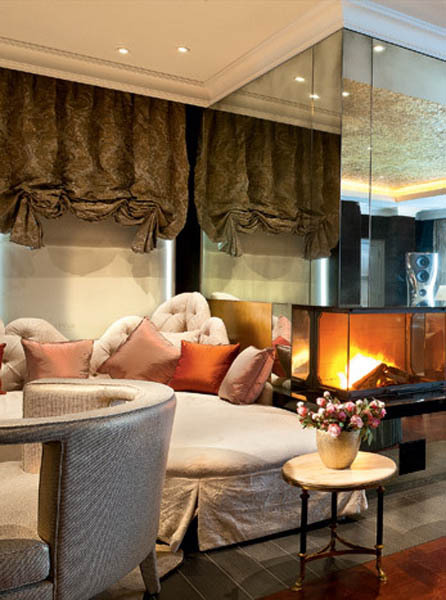 Modern fireplaces create comfort in traditional and contemporary homes. They make rooms feel warm, comfortable and pleasant. A fireplace is perfect for creating a stylish and welcoming sitting area. Even if you do not use the fireplace for heating your room, beautiful fireplace design, beautiful mantel or fireplace wall decorating ideas can enhance your interior. 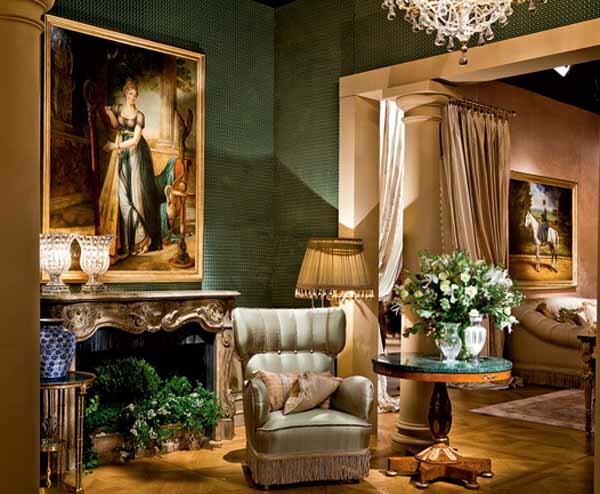 Classy fireplaces in a vintage style and modern fireplace designs can make the interiors look exclusive and expensive. Russian architect Anastasia Leonidova combined a contemporary round fireplace in black color with stone wall design to create this spectacular living room. The appliance is hanging from the ceiling and adds a touch of modern style to gorgeous interior decorating. A stylish fireplace, natural stone wall design, and leather paneling in rich brown color create comfort and warmth in this expensive room. An oriental rug unites all home furnishings with a fireplace and personalizes the interior with ethnic accents. Designer Nicolas Haslem and NH Design in London created this modern living room by adding mirrored glass panels to the fireplace wall design. The mirrored surfaces create the illusion of openness. The mirrors reflect more warmth and light into the room, make the interior design feel unusual and exciting. The comfortable furniture, soft velvet fabrics, and modern decor accessories create the exclusive, relaxing and luxurious living room design. A classic fireplace design by architect Yulia Nesterova and wall decorating with an oval mirror in classic style and elegant striped wallpaper in white and beige colors are excellent bedroom decorating ideas. Stylish furniture in vintage style, antique pieces, neutral curtain fabrics and soft upholstery texture add elegance to classy and sophisticated interior design. Calming and neutral interior design ideas by architect Alexander Kakorin, black and white color palette and clutter free room decorating with beige accents create this beautiful living room design with an elegant fireplace painted black. Pleasant wall colors, large windows, contrasting details, and comfortable accessories make the fireplace seating area with two beautiful chairs look very comfortable. 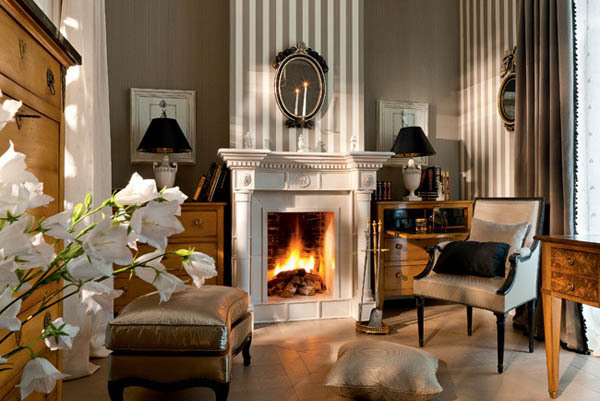 Classic European fireplaces inspire this black and white fireplace design by Sergey Silakov. Black and white decorating looks stunning with white chairs and modern lighting, striped black and white curtains, large wall mirrors and elegant crystals. 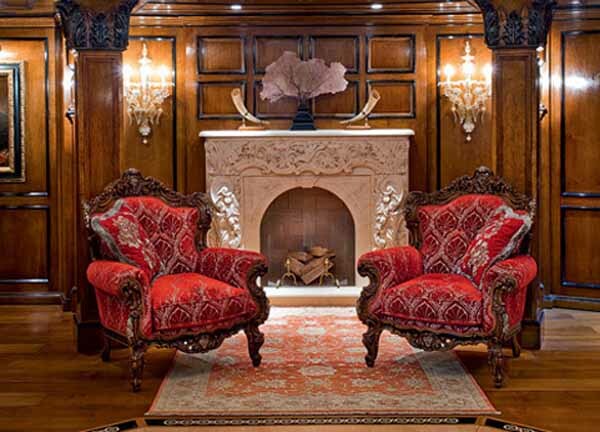 Italian fireplace design Provasi features gorgeous carved wood decoration. A soft chair in vintage style, round tables with natural stone tops, crystal lighting fixtures, green wallpaper, creamy white paint color, and paintings create this luxurious interior design and emphasize the romantic atmosphere of European palaces. 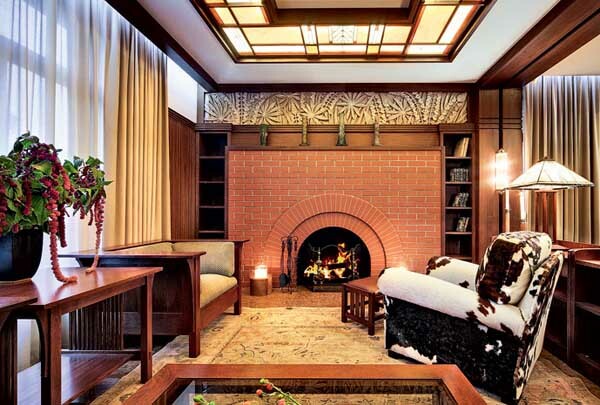 Brick fireplace design by Natali Avdeenko creates a beautiful room with traditional bookshelves made of chest wood, modern furniture and lighting fixtures in Art Deco style. Unique wall accents and a floor rug brings floral designs into stylish room decorating. A blooming indoor plant adds a charming detail to modern interior design and creates a very pleasant atmosphere. Architects from Latvia Zaiga Gaile, Lega Apine, and Zane Dzintara spend two years creating their antique collection of classic fireplaces and wood stoves. 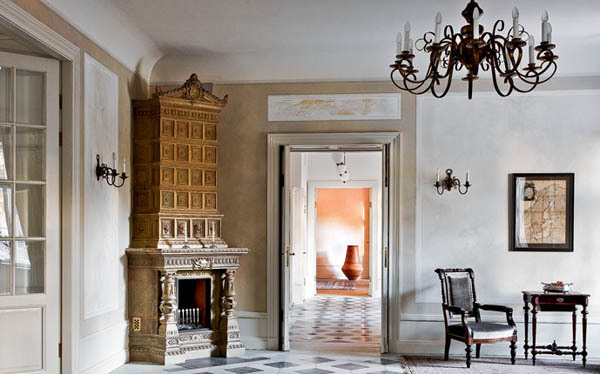 These fireplaces with traditional ornaments convey the spirit of historic homes built in the 19th century. 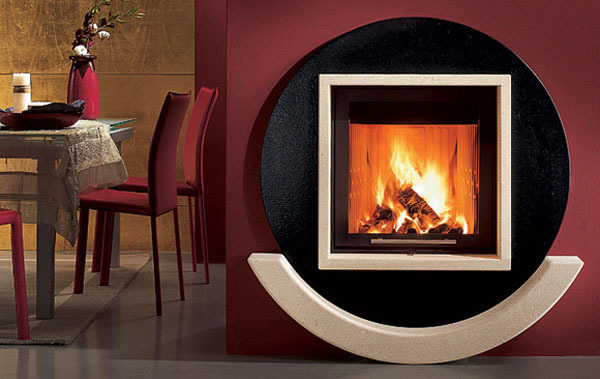 Beautiful contemporary fireplace India by Caminetti Montegrappa brings eye-catching contrasts of black-n-white into the living space with the red walls and furnishings. The modern fireplace has an attractive shape, balancing circles and squares, and creates a stunning focal for modern interior design around this contemporary fireplace.